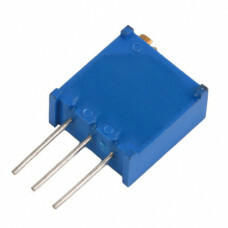 Trimpot is a high accuracy variable resistor and pcb mountable with 3 terminal pins. The voltage between the terminal varies as the trimpot is rotated. The Variable resistors are used for variating voltage as per the need in a circuit. The outer two pins are connected to Vcc and 0V, and cetner pin outputs a variable volatge between 0v and Vcc as the rotary cermet is rotated.